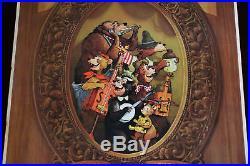 Orig Attraction Poster Country Bear Jamboree Disneyland Walt Disney World 1972. SATURDAY’S TOYS Presents… An original / vintage Disney attraction poster designed in 1972 for both of the existing Disney theme parks Disneyland and Walt Disney World; as referenced in bold lettering at the bottom section of the poster. 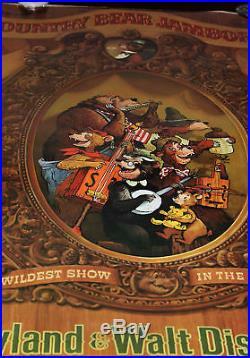 Walt Disney World’s Magic Kingdom theme park was the first to debut the “Country Bear Jamboree” when it opened to the public on October 1, 1971. Due to the overwhelming popularity of Florida’s attraction, Disneyland made the decision to replace its original Indian Village with its own version of “Country Bear Jamboree” in a new land to be called “Bear Country”… Known today as Critter Country. As such, WED Enterprises opted to design their first multi-use attraction poster for both Disney theme parks and the poster was placed into use (in both parks) when Disneyland’s attraction opened in March 1972. 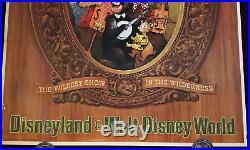 This particular poster was used on stage at Walt Disney World and was originally obtained by a former WDW cast member who has preserved the poster in dark storage since that time. 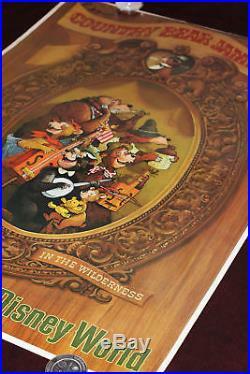 This Frontierland cast member (Davy Crockett Explorer Canoes) acquired the poster shortly after replacement posters were installed in their protective display cases at the Magic Kingdom. This cast member had an appreciation for graphic arts and was later contracted to help design several issues of “Disney News” magazine during the late 1980’s as well as of memorable art campaigns for Disneyland throughout the 1980’s and 1990’s. As the 37″ x 54″ over-sized attraction posters were often installed outdoors, the posters were replaced at least annually (and more often when impacted by the elements). 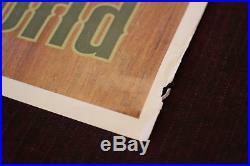 The poster retains the moisture stains on the points where rain may have gotten behind the frame / glass; noticeable primarily on the reverse side of the poster. 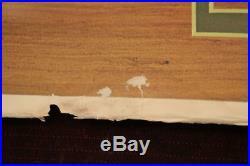 This is the standard condition found on most authentic Disney attraction posters of that era. Caution is recommended any time one of these posters is presented without flaws… As they normally made their way into the hands of cast members only after they had been used within the parks. When properly framed, the poster displays just as nicely as when it was first installed in 1972. This was among the first Disney theme park attraction posters to be created using a lithographic printing process rather than the traditional silk screen method that had been used since Disneyland opened in 1955. The centerpiece of the poster features the unmistakable art of Disney Legend and original WED Enterprises Imagineer, Marc Davis (also included among Walt’s legendary “nine old men” of animation). 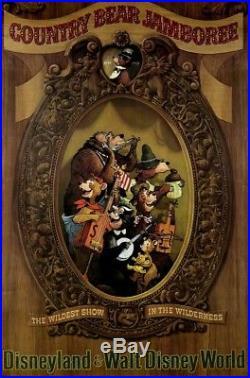 His concept art for the Country Bear Jamboree was on display in his office during late 1966 when Walt Disney made one final visit to check into Marc’s progress on the attraction. After laughing together at the characters that Marc had created, Walt turned around to leave. Marc Davis had never heard Walt leave a meeting that way… Instead always saying “see ya next week” or something similar. The greeting turned out to be the last words he would ever share with the man who had been his boss since he was first hired as an apprentice animator for the Walt Disney Studio in 1935. Also contributing to the additional design elements of the poster were WED Imagineers Eddie Martinez and Jim Michaelson; both significant contributors to magnificent art displayed in Disney parks and resorts worldwide. A worthy candidate for the finest Walt Disney archive or museum collection; suitable for framing and preservation for future generations. 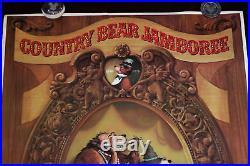 The item “Orig Attraction Poster Country Bear Jamboree Disneyland Walt Disney World 1972″ is in sale since Tuesday, December 12, 2017. 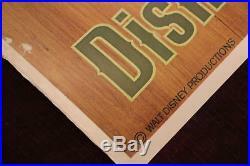 This item is in the category “Collectibles\Disneyana\Vintage (Pre-1968)\Theme Park Souvenirs”. 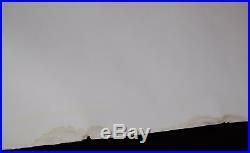 The seller is “saturdaystoys” and is located in Bakersfield, California. 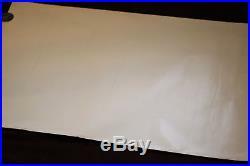 This item can be shipped to United States, Canada, United Kingdom, Denmark, Romania, Slovakia, Bulgaria, Czech republic, Finland, Hungary, Latvia, Lithuania, Malta, Estonia, Australia, Greece, Portugal, Cyprus, Slovenia, Japan, China, Sweden, South Korea, Indonesia, Taiwan, Thailand, Belgium, France, Hong Kong, Ireland, Netherlands, Poland, Spain, Italy, Germany, Austria, Russian federation, Israel, New Zealand, Philippines, Singapore, Switzerland, Norway, Saudi arabia, United arab emirates, Qatar, Kuwait, Bahrain, Croatia, Malaysia, Chile, Colombia, Costa rica, Panama, Trinidad and tobago, Guatemala, Honduras, Jamaica.